With all the necessary components built-in, spend your time setting up your ideal environment, then plug it in and enjoy the results. The Oceanic BioCube features high-quality components and can be used for saltwater or freshwater setups. Enhanced filtration system features dual filter intakes to draw aquarium water from the surface and mid-water for improved water circulation and filtration. Replaceable 2-stage filter cartridge provides easy-to-maintain mechanical and chemical filtration. Bio-ball wet/dry filtration system improves gas exchange and provides efficient biological filtration. Viewing window for filtration water pump to ensure optimum performance. UL-Listed submersible pumps. Includes a comprehensive aquarium lighting system with Coralife compact fluorescent lighting, Lunar Blue-Moon-Glow LEDs, and dual cooling fans integrated into the hood. Individual power cords allow timer operation for custom light schedules. Curved glass front corner for a panoramic aquarium view. 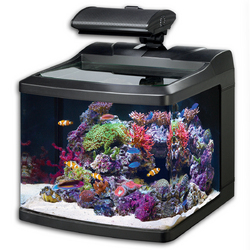 Biocube HQI offers an aesthetically appealing design and high quality components that make reef-keeping easier and rewarding. The key component is the HQI metal halide light which provides the high intensity lumen output preferred by reef-keeping enthusiasts. Now you can create a thriving coral reef with a broad variety of organisms including small polyp stony (SPS) corals and Tridacna clams. 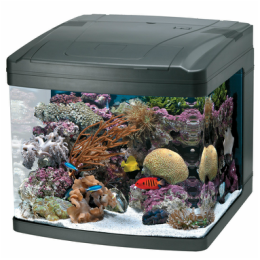 Healthy reef-keeping also requires proper filtration and Biocube HQI has everything you need including a protein skimmer for removing harmful organic waste, a refugium chamber for establishing biological filtration and a replaceable filter cartridge to eliminate particulate matter. And don’t forget beauty. Since a thriving coral reef is a beautiful reef, Biocube HQI includes a clear glass canopy for showcasing your aquatic masterpiece. The canopy is easily removed for stocking, water changes, and ongoing maintenance. * Please note that we do not ship. This is for pickup or delivery only please.